MinSim Plc. provides simulation-based training services for healthcare providers and organizations. Our clientele consists of healthcare workers from high skilled professionals to novices and students. Simulation training is more than classroom learning. It is a low-risk approach to learn skills needed in real-life healthcare situations. Training in simulated environment improves patient safety. Learners can make mistakes in simulated environment, learn from them, and boost their confidence in their abilities. 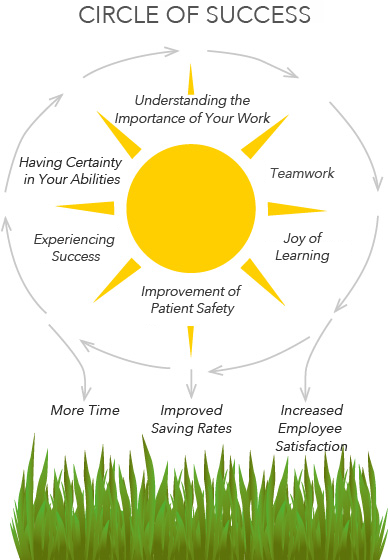 Simulation training is also beneficial from the viewpoint of healthcare organizations: removing unnecessary risks of harming patients can lead to increased employee satisfaction and even improved saving rates. MinSim Plc. provides highly skilled instructors with strong empirical backgrounds. Our techniques for learning include working in teams, and putting communication front and center. The synthesis of our instructors’ pedagogical knowledge and drama education techniques ensure positive results in learners’ perceptions of clinical learning. Simulation training is a technique that triggers the circle of success!